This will be the final version of my “Why Mobile in……” presentation. I’ve created one of these presentations, around this time of year, for the past 3 years to help explain why it was important to take “mobile” as a channel seriously. The presentations were designed to encourage our clients and to make the jump to a responsive design website sooner than later. I’m pleased to say that most of our clients have. You might find some of our web design case studies interesting, to see which ones have gone responsive and what results they’ve had. There are just a few of our clients that have been holding off for various reasons and this presentation is aimed at them. That said, this presentation makes interesting reading as you’ll find in it information that you won’t necessarily be aware of. You’ll find that the smartphone has become the must have aid, or companion, to many people in the world today. It’s ability to help users access timely and relevant information has surpassed that of the humble desktop or laptop. You’ll find that it’s a second device in almost all activities including work or leisure activities. So having a website that has a responsive design is essential. If you’ve not done it then you are now officially behind the responsive design curve. Indeed, you’ll find a recent announcement from Google in this presentation that makes this even more compelling. Responsive design is not just about making a website look good on a mobile or smartphone. To get responsive web design right you need to consider the content too – what information would be useful for a mobile user in particular. You’ll see from the presentation that the smartphone or tablet is often used when watching TV. People aren’t going to read a lot of information when watching TV – they will want snappy, easy to digest information. Indeed, as the name implies, often the mobile is used when people are, er…mobile! Out and about. Having easy to digest and actionable information is paramount for this type of user. Responsive design should take this into account and make life easy for your mobile website visitors. 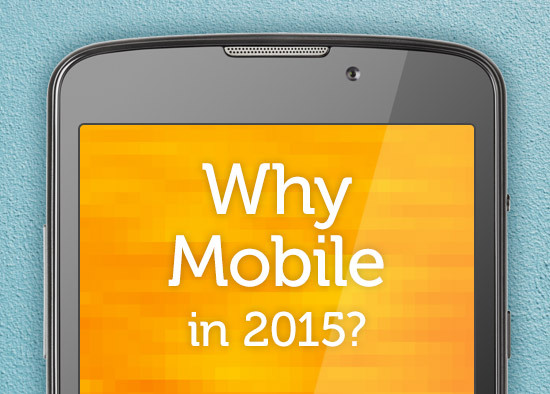 Have a look at Why Mobile in 2015?, if you have any comments of feedback send me a message via our contact us form, found on every page on our website: Wisetiger. I’d love to hear from you and value your feedback. Having said that this will be my final presentation entitled “Why Mobile in….”, it wouldn’t be the last one on the topic of Responsive Design or indeed Mobile Communications. The challenge of how to leverage the mobile communication channel to your customers and users has only just begun. My blogs for the coming year will be on the theme of how to improve using the mobile channel. How to use responsive design to improve the way you communicate across all communication channels and indeed deliver better customer service, relevant information and increase engagement and conversion on your website.